Step 1 Preheat the oven to 475 degrees F.
Step 2 In a small bowl, mix together the spices. Step 3 Place the cauliflower florets and carrot pieces on a large lightly oiled baking sheet. Season with salt and pepper. Add a little more than 1/2 of the spice mixture. Drizzle generously with olive oil, then toss to make sure the spices evenly coat the cauliflower and carrots. Step 4 Bake in the 475 degrees F heated-oven for 20 minuteps or until the carrots and cauliflower soften and gain some color. Remove from the heat and set aside for now. Turn the oven off. Step 5 In a large cast iron pot or Dutch oven, heat 2 tbsp olive oil. Add the onions and saute for 3 minutes, then add the garlic and the remaining spices. Cook on medium-high for 2-3 more minutes, stirring constantly. Step 6 Now add the chickpeas and canned tomatoes. Season with salt and pepper. Bring to a boil, then reduce the heat to medium- low. Cover and cook for 5 minutes or so. Step 7 Stir in the roasted cauliflower and carrots. Bring everything to a boil, then reduce the heat to medium-low, cover and cook for another 15-20 minutes. Be sure to check the stew, stir occasionally, and add a little water if needed. Step 8 Remove from the heat and transfer to serving bowls. Garnish with fresh parsley and the toasted nuts. Enjoy hot with pita bread. If you ever need a break from the usual beef stew, this vegan chickpea stew is the answer! 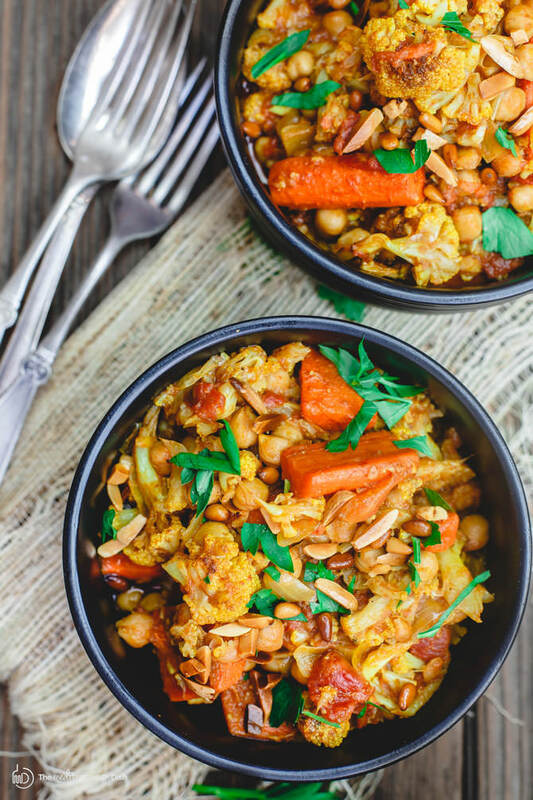 A satisfying alternative with roasted cauliflower, carrots and chickpeas. All cooked in a flavor-packed chunky tomato sauce. Step-by-step tutorial below.